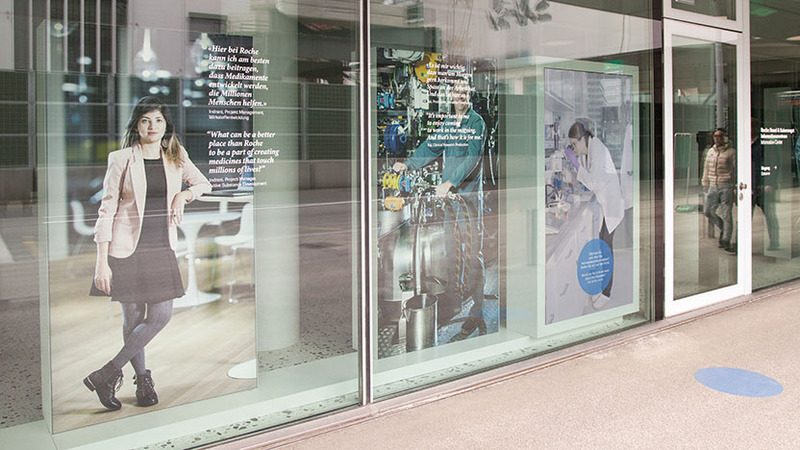 Roche’s newly opened and publicly accessible visitor centre is situated on the ground-floor of Building 1. 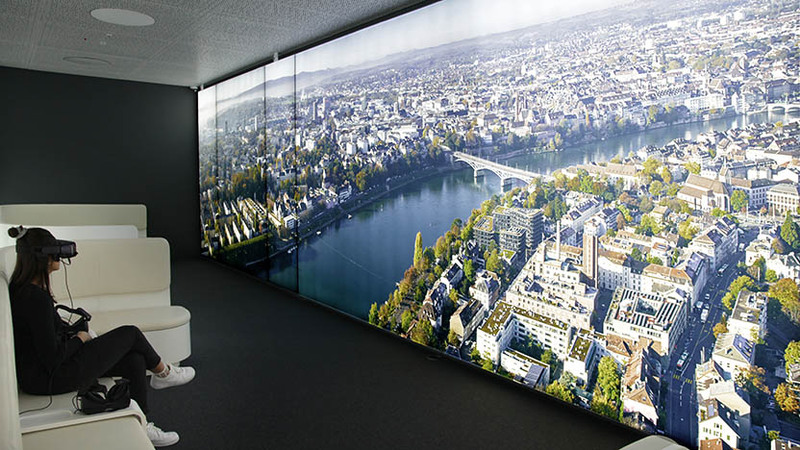 Here, several interactive stations provide an insight into the company, its history, the two company sites Basel and Kaiseraugst, and the buildings which are in process of construction there. Illuminated models of both sites give an overview of the respective areas. Various working areas and individual buildings can be illuminated and additional information called up via touch screen. 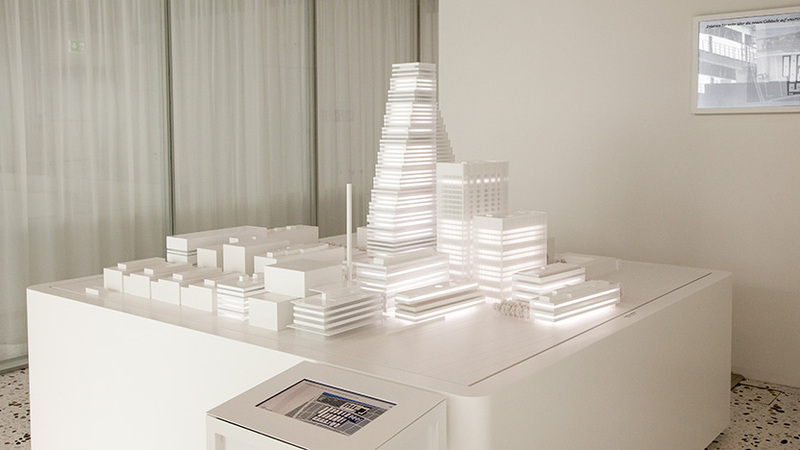 A large model of the newly constructed buildings at the location Basel shows the projected building progress and the segmentation of the buildings into different areas of use. To this end almost 3000 addressable LEDs were installed. Tweaklab implemented the media technical planning, the development of the models together with the model maker, the programming and the installation. 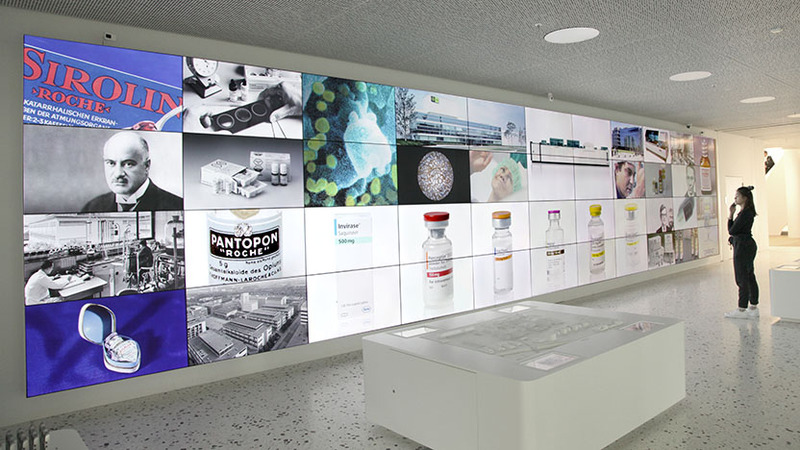 A large video wall, consisting of 44 HD-monitors and audio guides, tells the story of the company Roche. Tweaklab took on not only the task of the media technical planning, but also the editing of the video material. 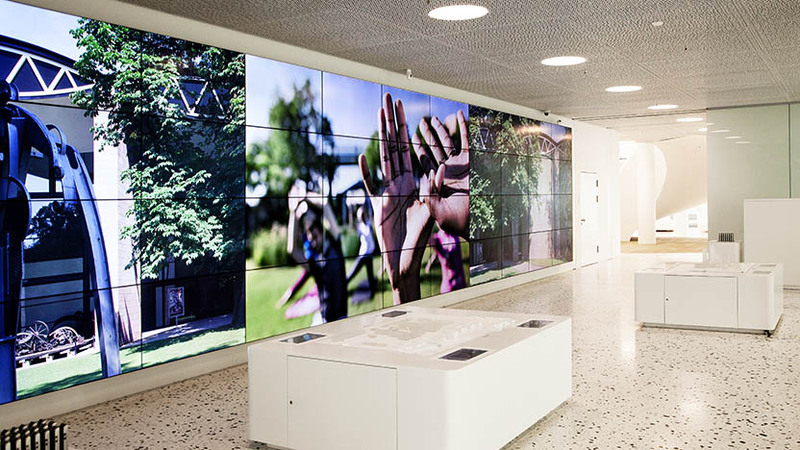 For that purpose existing videos and photographs were cut for the 44 monitors and adapted to the new form of presentation, so that they run synchronously and the result is a multifarious presentation. Using 3D glasses the visitors can plunge into the various floors. Most of the images are static, some situations surprise with video sequences: A laboratory assistant working with a microscope, and at one click you get a look into the world of cells, or: a cyclist getting off his bike in the basement and some charts provide information about the subject “mobility”. Beside the media technical planning and programming Tweaklab implemented the video sequences of the laboratory assistant and the cyclist in green-screen technique, and also the post production. 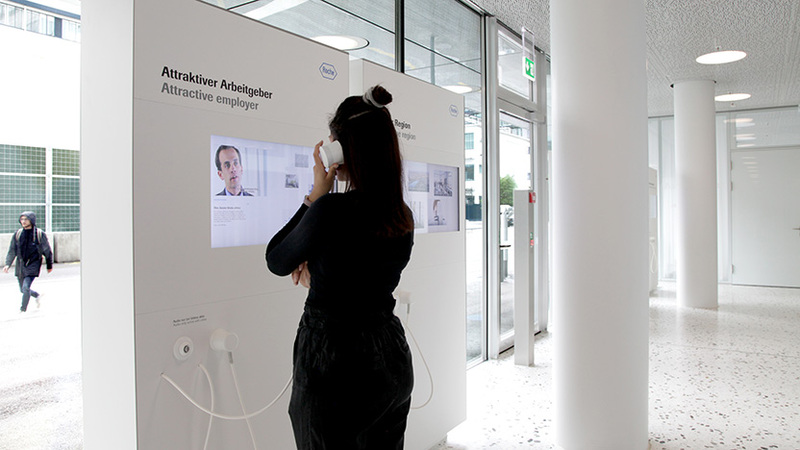 Both inside and towards the outdoor space there are several information stands where the visitors can find further information on for example “Roche as an employer” or “regional development”. On the inside, the stands are equipped with touch screens and one-hand earpieces. 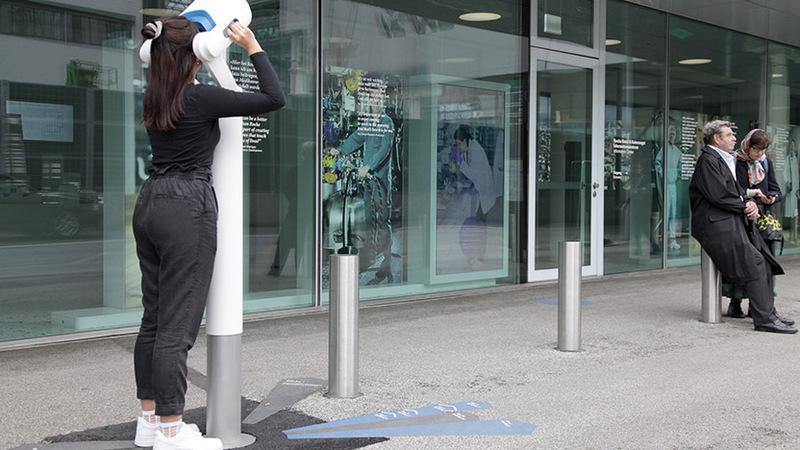 For the screens that are directed towards the street a different kind of operation control was selected: The viewers can control the navigation of the screens by hand movement. Tweaklab planned, programmed and installed the touch screens and implemented the video recordings and the post production. Outdoors there are two telescopes through which – depending on their position – you can see the individual projected buildings and those currently under construction in a 3D-simulation in the year 2023. Tweaklab developed and programmed the telescopes using Red Design, the 3D-rendering was provided by Herzog & deMeuron.